STEM Santa Fe is proud to be the leading organizer of the Fall Expanding You Horizons conference in Santa Fe. Expanding Your Horizons (EYH) is a conference for girls in 5th-8th grade. This day-long event will include hands-on workshops in science, technology, engineering, and math (STEM) led by women professionals. At the conference, girls will get a chance to meet STEM role models and learn more about careers in those fields. Our goal is to motivate girls to become innovative and creative thinkers ready to meet 21st Century challenges. STEM Santa Fe’s 2017 Expanding Your Horizons Conference was attended by 165 fifth through eighth grade girls. This conference featured 16 workshops, a STEM and college careers fair, and a keynote address by Jessica Perea Houston, Associate Professor in the Chemical and Materials Engineering department at New Mexico State University. 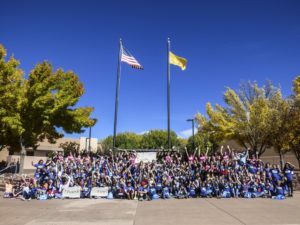 Saturday October 15, 2016 conference was attended by 168 girls in 5th to 8th grade from Northern New Mexico. The program included a keynote address, 12 STEM workshops and a STEM and College Fair.